A mask that can easily be made with items you most likely have on hand. 1. Gather your material. You will need an oval piece of cardboard with two holes for the eyes (I used the cardboard that separated the levels in a basket of peaches), white cardboard, beige Fun Foam, heavy brown cardboard (I used the material that separated the layers in a box of fancy cookies), red Fun Foam, scissors, a dark marker (not shown), white glue, and a Popsicle stick. 2. 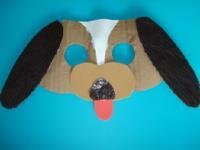 Cut two long ears and a tiny nose out of the heavy brown cardboard. 3. Cut one or more spots out of the white cardboard. 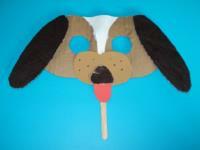 Cut your puppy's mouth out of the beige Fun Foam. Finally, cut a tongue out of the red Fun Foam. 4. 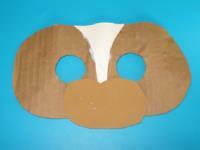 Glue the spot(s) on the mask and add the mouth. 5. 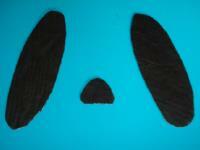 Glue the ears on either side of the mask. 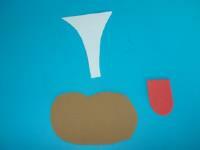 Add the tongue and nose. 6. 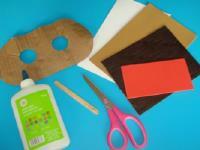 Use the marker to draw tiny spots and stick the Popsicle stick behind the mask. 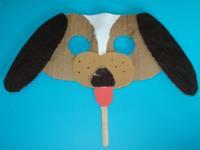 Prepare to hear plenty of barking sounds in your daycare!